That is the question posed by Todd Hale, who examines the impact of each approach to growth on frozen and refrigerated sales. 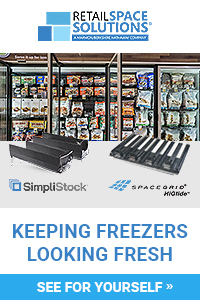 While total year-over-year sales have been fairly flat, some frozen and refrigerated foods are delivering high levels of sales and growth. Within the dairy department, milk and cheese are huge drivers of annual sales, followed by yogurt, juices and drinks and eggs. Two of these top sellers also made the list of top drivers of long- and/or short-term growth (four-year CAGR and most recent 52 weeks versus year ago). 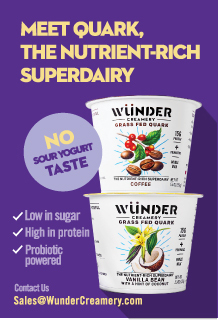 Eggs is on the list of both long- and short-term top growth drivers, while yogurt is a top seller and a top driver of long-term growth. 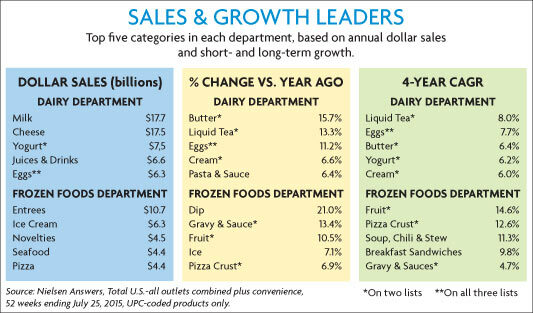 Butter, liquid tea and cream also made the list of dairy department categories with the highest levels of both long- and short-term growth. And pasta sauce was a top driver of short-term growth. 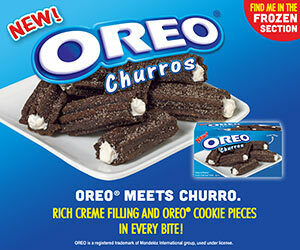 Within the frozen department, top sellers include entrées, ice cream, novelties, seafood and pizza, but none of the top sellers were on either of the lists of top long- or short-term drivers of growth. 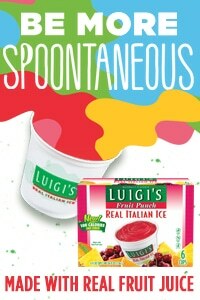 However, some frozen categories are driving significant long- and short-term growth, and three of them — fruit, pizza crust, and gravy and sauces — were on the top-five list for both. Soup, chili and stews, and breakfast sandwiches round out the list of categories driving the most long-term growth, while dip and ice complete the list of top short-term growth categories. Most frozen categories with low sales have issues with growth. What is needed to revitalize these categories: innovation and/or more promotional support? A comparison of category dollar growth to levels of promotional support shows no correlation between the two. In fact, there are about as many categories with high promotional support that are growing as are declining. And there’s high growth in categories with both low and high levels of promotional support. A comparison of category dollar growth trends to changes in levels of promotional support reveals no correlation between increased promotional support and category growth either. In fact, there are more growth categories where promotional support has fallen. These findings support Nielsen research that suggests promotional planning needs to be very purposeful to ensure it is used to drive incremental volume to benefit both manufacturers as well as retailers. Milk is a $17.7 billion category (within Nielsen-measured retail channels), largest among the NFRA categories, but near-term sales were off 1.8% and long-term sales growth was just 0.3%. However, these figures don’t come close to telling milk’s amazing story. A drill-down into category segments provides an excellent example of how product innovation within specialty milk, milk substitutes and organic milk drove big growth in a category with huge sales and importance across the store. 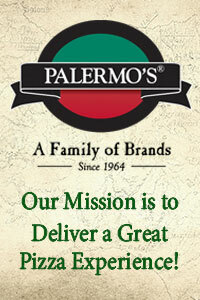 Innovation within yogurt, refrigerated juice and eggs also yielded excellent growth within the dairy department. These findings are not meant to suggest that manufacturers and retailers should make drastic cuts in their product promotions and funnel those dollars into product innovation efforts. Consumer interest in value is still very important, even in good economic times. However, increased spending has not been delivering consistent gains commensurate with the huge amounts of money spent on trade promotions. At the same time, very few product innovations survive in the marketplace. All the more reason to ensure you are being very thoughtful about how your company promotes and innovates. 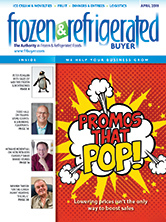 Frozen & Refrigerated Buyer magazine is the number one choice for both advertisers and readers in the frozen and refrigerated industry. 88% of our subscribers reported taking one or more actions as a result of advertisements or articles in our magazine.